I partnered with Baby Box University on this post on how to receie a Free Baby Box. However, as always, all thoughts and opinions are 100% my own. Thank you for supporting the brands that help support Rookie Moms. New moms will love the resources available at no cost through Baby Box University. Baby Box launched in California this past March 7th, 2018. Now California Moms (and Dads) can receive free educational resources to help prepare them for bringing home their baby. And, all parents also qualify to receive a free Baby Box. The Baby Box company’s mission is to ensure that new parents receive the education and resources needed to give their babies a healthy & safe start at life. I first found out about the Baby Box after reading an article on how in Finland Baby Boxes (along with parent education) was driving down the infant death rate, in fact Finland has reduced their rate down to half of what it is in the U.S. So, I was thrilled to hear they were starting to offer their Baby Boxes here in the states as well. 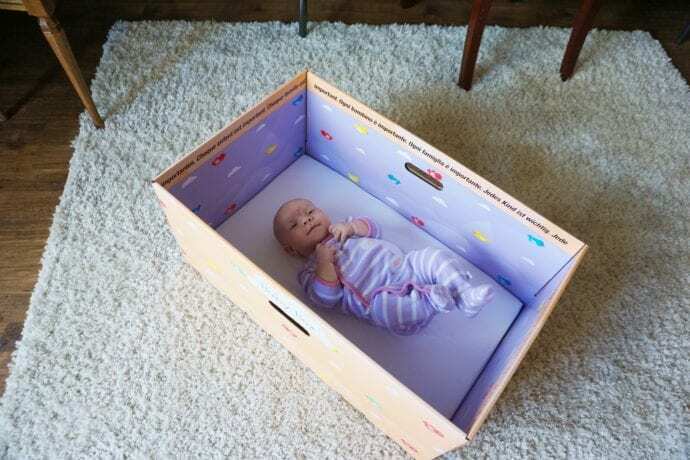 So, what is a Baby Box exactly? 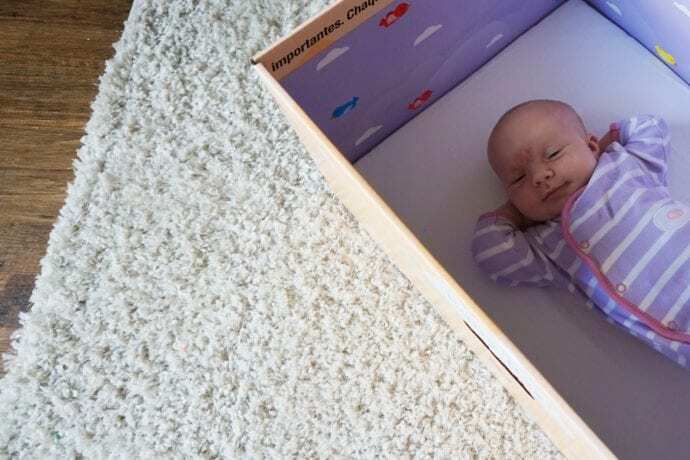 The Baby Box is a sustainably designed sleeping device. It is lightweight and portable and can be placed in any room. 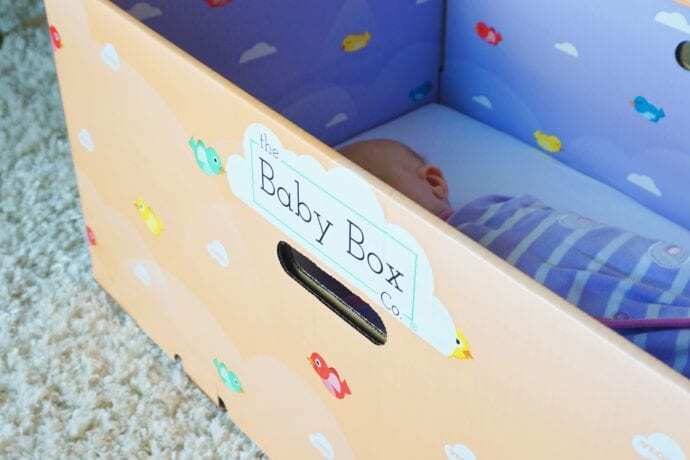 It is also worry free because new parents know that as long as the Baby Box is placed on the ground, the baby is on their back and there is nothing else inside the box that their baby is safe. What is Baby Box University? The Baby Box University is an online resource for new parents that contains educational videos, activity suggestions, and content for new parents that covers topics from pregnancy through preschool. There are also special courses available for select states such as California. When a new mom completes the state course they may be eligible to receive a free Baby Box. Watch a short series of videos selected by local experts. New parents receive free and valuable information about safe sleep, nutrition, breastfeeding, vaccines and more. 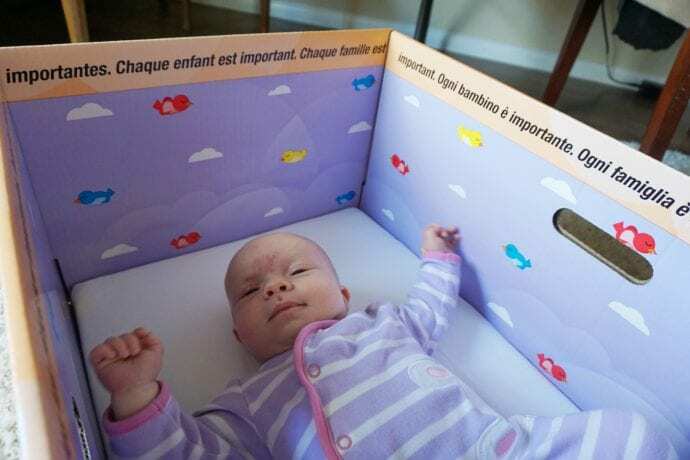 New parents receive a FREE Baby Box which provides their baby with a safe place to sleep. New parents also receive helpful samples like diapers, breastmilk storage bags and more. New parents gain confidence in their knowledge and ability to take care of their new baby. I took the California course myself and thought it was incredibly insightful. As a new mom I remember being totally freaked out taking my first born home. I really had no idea what I was doing. I really wish I had access to the Baby Box University back then as it would have made me feel more confident in my ability to care for my baby. It also would have prepared me for some of the questions I had the first few months. For example, I love the way that they laid out how a new mom can tell that her baby is getting enough to eat. That was something that I remember really stressed me out as a new mother. I was breastfeeding and without having a bottle I was very concerned with knowing how much milk my baby was actually receiving. The Baby Box course gave very simple, straightforward, actionable ways for new moms to make sure that they could rest confidently knowing their baby was well fed. A resource like this where you can get a FREE Baby Box can help new moms gets my stamp of approval and I would LOVE if you could help me spread the word to all the expecting parents in your life. Do you know someone who might benefit from the Baby Box University? Please share this post with them. Disclaimer- I partnered with Baby Box on this post. However, as always, all thoughts and opinions are 100% my own. Thank you for supporting the brands that help support Rookie Moms.